Existing Smoyer-Wathen monument located in northwest Boone County. At their Dec. 12 regular meeting, Boone County Commissioners approved the placement of a memorial on the courthouse grounds to commemorate two law enforcement officers who were killed in the line of duty nearly 80 years ago. 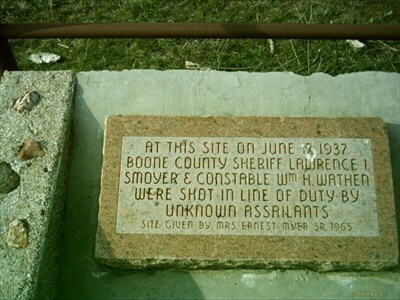 Pat Wagner and Karen Stewart, representing the Smoyer-Wathen Monument Committee, presented the proposal to install the monument on the courthouse grounds in memory of Sheriff Lawrence Smoyer and Constable William Wathen, who were killed in Boone County by unknown assailants in the line of duty on June 17, 1937. The 80th anniversary of that date is coming up in June of 2017, and the committee is seeking approval to place the monument on the courthouse grounds, where it will be more convenient to visitors. The commissioners will be asked to determine the location, but the committee “does not want to compromise” the existing memorial to veterans. The memorial on the courthouse grounds would be available for viewing at all times, and the public would have easier access than it has in visiting the existing monument northwest of Akron, said Wagner. Also, the Smoyer family once lived in the old courthouse. The memorial would be approximately 40 inches wide and 38 inches tall. It would include a picture of each man and a brief description. It would also have room “to honor other fallen Boone County law enforcement officers should such a tragic event occur,” said Wagner. A fund drive is planned to pay for the new memorial, with an estimated cost of $5,000 to $6,000. The committee hopes to have the memorial in place for the 80-year commemoration on June 10, 2017.